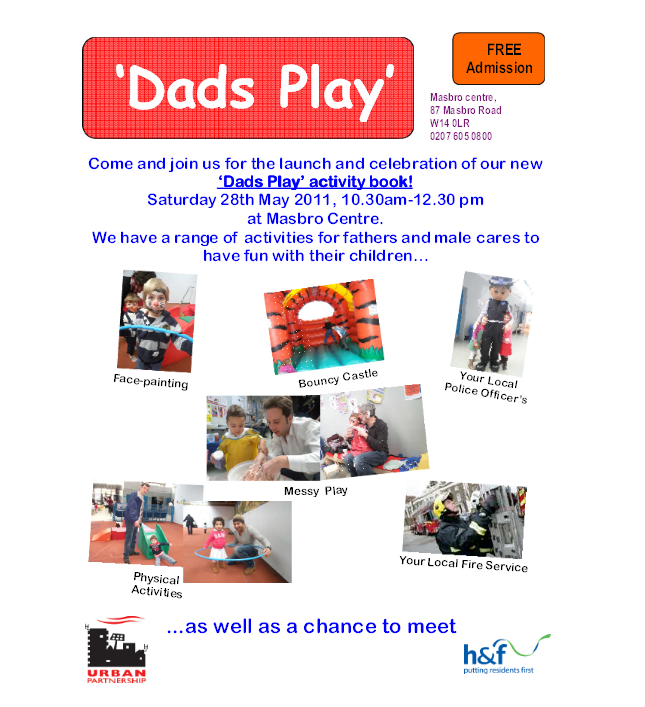 The Masbro Centre has just announced that they are having a special day of activities and fun for Dad's/Male Carers to share with their little ones. It will take place next Saturday morning (28th May) from 10.30 until 12.30. When I was at the Centre last month I was told that events focused on encouraging dedicated father-children fun and interaction were some of their most successful and so it's great to see this day being held to launch a "Dad's Play" activity book. Please spread the word to any fathers or male guardians or carers out there you may know. Following my visit to the Masbro Centre I couldn't be more convinced of their commitment and passion for the local community. The importance of this can't be emphasised enough when you recall the recent violent crimes that have shocked us all. We really don't know how lucky we are to have these types of projects and initiatives in our area and for free! For more information about the Masbro Centre head to www.upg.org.uk. Now, I wonder, aged 29, if I bring my Dad along can I meet and play with the firemen? How about a round of applause?